We've got all sorts of Chinese flag printables here, for projects, decoration, classroom work and crafts. 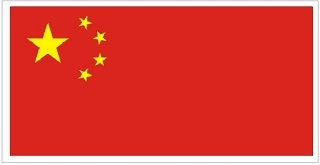 The National flag of China consists of a red field with five, five-pointed yellow stars in the top left corner. The red colour represents the communist revolution and the stars represent the unity of the people under the communist leadership. One of the stars is larger than the other four. The flag is sometimes referred to as the ‘5 Star Red Flag’. The kids can have a go at writing an acrostic poem about China using these printable pages, with or without flags to decorate. They make useful writing frames, too. Print and fold our little China flag booklet to store what you learn about this Asian country. You will need our origami booklet instructions. We have four types of China bookmarks - with and without the name of the country, and in colour or black and white. Colour in the China flag with our printable colouring page. It's just one of many flag colouring pages here at Activity Village! Print out this page and turn it into a jigsaw with the help of our jigsaw cutting guides. Then the kids can put the China flag back together again! There are three different size flags for you to print out on this China flag printable, perfect for all sorts of projects. Use this notebooking page to write about all about China. It features the country's flag in the corner and lots of space for writing! Our lacing cards are great fun for young children, and our Chinese flag printable has a nice simple outline. Print onto some card and cut out. Laminate if you want it to last, then use a hole punch to punch holes evenly around the edges. Lace or sew!